If you were to marry Settebello and Custom Built pizza, Novecento would be born. I stopped in for dinner. It was pretty quiet and no wait, I ordered a margherita pizza with fresh tomato ($10). The staff seemed to be pushing the salads, I had four ask if I wanted salad - No thanks (x4). A wide spread of toppings is on display, much like Custom Built, but here it'll cost you a pretty penny if you add more than a couple. The crust is pretty thin and wet so you'd probably only want a few at most. But possibilities are endless. By the time I filled my drink and grabbed a seat my pizza was ready. It had a nice char, I wish it was a bit more crisp, but it had good flavor, and fresh ingredients. However, it is Settebello that brings me right back to Italy. My pizzas there have been more evenly cooked and a bit better flavor and texture. Had I never been there or Italy, I'd think more highly of Novecento. 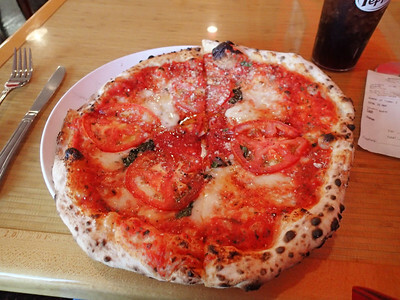 Within a half mile on Eastern you can have solid NY style at Grimaldi's, great Chicago style at Windy City Beefs N Pizza and Novecento provides a taste of Italy with its Napoletana style pizza. It's win-win, for whatever your mood.